Tom Wood says he feels for George North, labelling his Saints team-mate’s current situation a ‘nightmare’. North has not played since being knocked unconscious in the win against Wasps at the end of March. He has been undertaking the necessary concussion protocols and appears unlikely to feature in Saturday’s Aviva Premiership play-off semi-final against Saracens. And Wood has huge sympathy for the 23-year-old, who relishes the big occasion. “He’s going through it a bit, especially at this time of the year, when there’s big games to play and you’re not sure where you stand,” said the England star. “I guess you feel good within yourself, physically he’s big and strong and feels fit from the neck down. 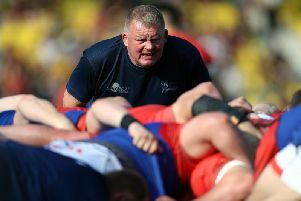 “It must be difficult for George, if you have a decision to make, in terms of looking after your head for your long-term future and your career after rugby, but also with a World Cup coming around the corner, but you have to sacrifice Premiership finals and semi-finals to do it. It’s a nightmare situation to be in.